W. Grohmann, The Art of Henry Moore, London, 1960, p. 8 (another cast illustrated, p. 118; plaster version illustrated, p. 119). A. Bowness, ed., Henry Moore, Sculpture 1955-64, London, 1965, vol. 3, p. 24, no. 418 (another cast illustrated, p. 24; plaster version illustrated, pl. 40d). H. Read, Henry Moore, A Study of his Life and Work, London, 1965, p. 219 (another cast illustrated, pl. 203). J. Hedgecoe, Henry Moore, New York, 1968, p. 289 (plaster version illustrated). R. Melville, Henry Moore, Sculpture and Drawings 1921-1969, London, 1970, p. 359, no. 526 (plaster version illustrated). A. Bowness, ed., Henry Moore, Sculpture 1955-64, London, 1986, vol. 3, p. 31, no. 418 (another cast illustrated, p. 31 and pl. 52; plaster version illustrated, pl. 51d). 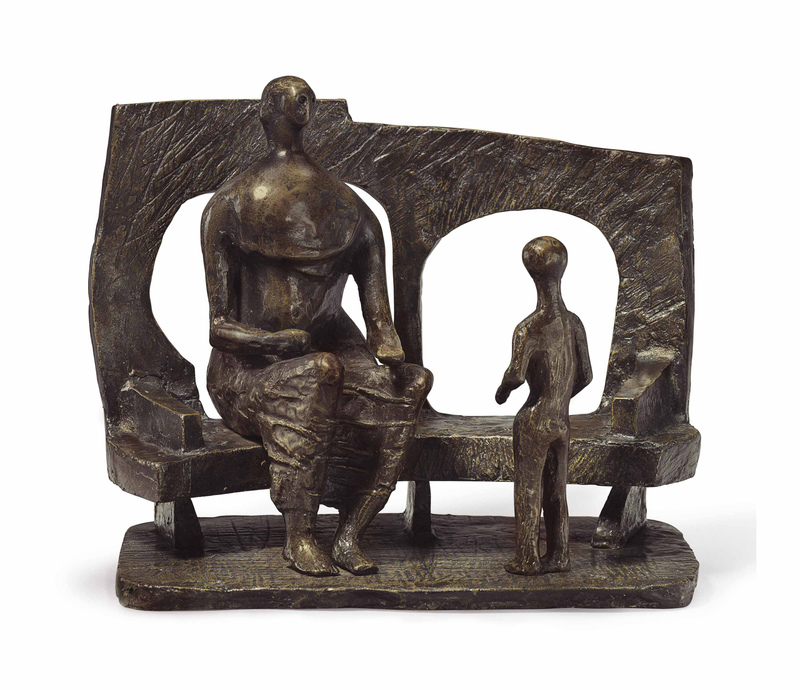 The archetypal mother and child held a privileged status in Moore's imagery throughout his career, providing a versatile paradigm for the sculptor's most persistent creative and formal preoccupations. Moore understood that the intimate relationship between mother and child lay at the heart of all human emotional and spiritual development, and for that reason it had been a constant theme in Western art, in both sacred and secular contexts. "The 'Mother and Child' idea is one of my two or three obsessions," Moore reflected late in his career, "one of my inexhaustible subjects. This may have something to do with the fact that the 'Madonna and Child' was so important in the art of the past and that one loves the old masters and has learned so much from them" (quoted in A. Wilkinson, ed., Henry Moore, Writings and Conversations, Los Angeles, 2002, p. 213). Moore first visited Italy in 1925, and his study of early Florentine painters comprised what he later described as the "most impressionable stage of [his] development" (quoted in ibid., p. 74). The architectural structure and religious subjects of early Renaissance painting (fig. 1) that had powerfully stimulated his sculptural imagination years earlier resurface in Mother and Child Against Open Wall, a secular adaptation of the eternal theme. Here, Moore restages the classical prototype, turning a New Testament theme into a universal, humanist image. The architectural aspect of the wall defines an integral sculptural space that is functionally hard and structured, a mainstay of classical art. But the wall is also open and permeable, its surface primitivized and its modified arches imperfectly round; as a screen, it becomes an abstract gateway for the transmission and passage of emotional energy. The reciprocal emotion established through the gesture of the mother and child as they reach toward each other releases externally through the openings in the wall, creating a dynamic equilibrium between the internal form of the sculpture and the space surrounding it. The negative space in the wall opening takes on a critical importance; it continues and defines the depth of feeling between mother and child and firmly anchors the connection against the pressures of the outside world. Mother and Child Against Open Wall was originally conceived as a preliminary idea for a commission Moore received in 1956 to design a large sculpture for the entrance to the new UNESCO headquarters in Paris. Moore initially "tried out the possibility of placing the figures against a screen, which would be an integral part of the group," according to Herbert Read, in four sculptures of family groups and seated figures against curved and open walls. Although Moore ultimately felt that the configuration didn't work in relation to the façade of the building, the figure groupings would "prove a fertile invention for the future" (quoted in Henry Moore, A Study of his Life and Work, New York, 1965, p. 216). Mother and Child Against Open Wall is the only one of this initial group of sculptures to be cast in bronze, and it remains a testament to what was for Moore the profundity of all human relations: "not only the dependence of the child on the mother," as Erich Neumann has suggested, "but also that of man on nature and of the individual on all life" (The Archetypal World of Henry Moore, Princeton, 1959, p. 165). (fig. 1) Fra Angelico, The Annunciation, 1438-1445. Museo di San Marco, Florence.